While my mom, elder sister, and I visited the Domain in Austin recently, we stopped in their antropologie. Oh my. We had such a good time browsing and I found this beautiful bag. 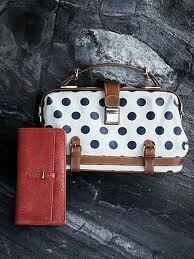 Who could resist its lovely navy and white spotted leather and its bright and vivid yellowish-green lining? It's perfect amount of vintage flair and modern structure? It even has a long shoulder strap that this picture doesn't show. Every time I see it I fall in love again. But then I saw the price tag. $268. Oh snap. Why must all beautiful things come at a price? Maybe for Christmas? Probably not. Oh well, I can dream can't I?